Chef Owned B&B in a charming historic house in the Village of Guilford. My place is close to The Village Green town center, shops, restaurants, Chocolatier, a bookstore. It's half mile to the local beach, and 4 miles to a National Seashore beach in Madison. 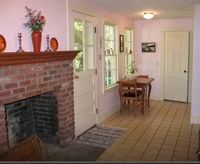 The cottage is full of light, has a cozy relaxing porch, and a great breakfast, until 10am. You want to take a Picnic lunch with you, or a cooking class here, talk to me... I've had couples, solo adventurers, business travelers, bicyclists or hiking enthusiasts, history buffs. I offer a savory tart class for $40 including the ingredients, eat it here as a pre dinner snack or take it home.